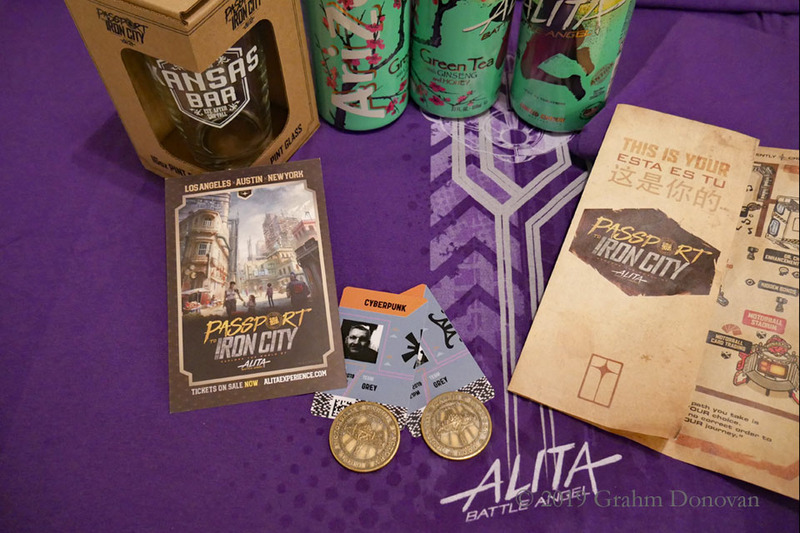 Ahead of the upcoming film Alita: Battle Angel, the filmmakers are offering a Passport to Iron City, an “immersive experience” allowing fans to step inside the movie’s environment. The film will be officially released in the U.S. on February 14, 2019, so I’ll admit that, at this point, I don’t know much more about the movie than the press releases and trailers. The film, based on manga comics by Yukito Kishiro, and directed by Robert Rodriguez, is the story of a cyborg in “a futuristic dystopian world” who must discover who she is and what her purpose might be. James Cameron, a writer and producer of Alita: Battle Angel, is featured in a promotional video about Passport to Iron City, and as soon as I saw it, I wanted to attend. The Passport to Iron City FAQs make clear that it’s not necessary to have seen the film to play, and I was fortunate to be able to participate. The Passport to Iron City experience is only available in Austin, Texas; New York, New York and Los Angeles, California, for a limited time. Currently, times are showing as available until March 3, 2019. SPOILER ALERT: The descriptions below may include some details about the film Alita: Battle Angel. 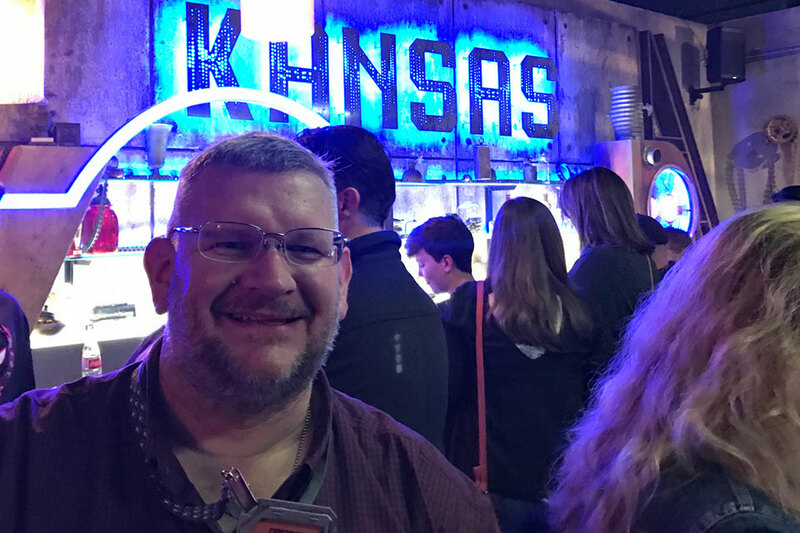 Players then move into a replica of the Kansas Bar that’s seen in trailers for the film. While players wait in the bar before moving into the game, they may review data screens at each table with background details about the world of Alita: Battle Angel. Various beverages are available at the bar, including beer that’s exclusive to each game location. Players move from the Kansas Bar onto the streets of Iron City, where a guide introduces some of the rules of play. Once the game begins, teams move to various stations to perform eclectic tasks and solve puzzles to earn points. The “residents” of Iron City do a fantastic job of keeping the action moving while allowing players to explore the elaborately built world. All the while, a leader board keeps a tally of team points and counts down the minutes, motivating teams to keep moving. Luckily, a competitive member of our group helped propel our team to victory, and we were bequeathed a special Iron City coin. 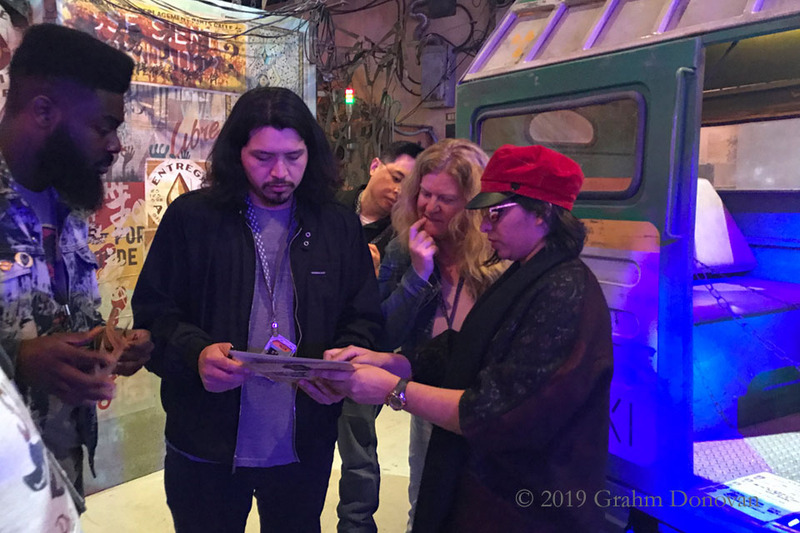 While I had initially been a tad skeptical that the game might be hokey, all of the members of our team found the event to be tremendous fun, and I would highly recommend it to anyone interested in Alita: Battle Angel, escape rooms, games or cyberpunk environments. If you’re near New York, Los Angeles or Austin, be sure to check out the Passport to Iron City site for more details. Tickets are $25 each through February 17, 2019. After that date, ticket prices currently rise to $40 or $45, depending the time of day.